Real-life genetics taught by a half-breed father and a child’s love for a natural-born retriever! The story is true, the dog is real, and the lesson everlasting. Regardless of species, we are genetically programmed to do what we do. Genetics dictate more than eye and hair color, or size, temperament and coat type in dogs. Descendents of the frontiersmen are independent and unusually mobile whereas a tradesman's genes tend to produce congenial and firmly rooted progeny. Generation by generation, humans move further away from our genetic roots as we’re shifted by today’s technology and mobility. Fortunately, that's not so with our dogs. When you think about it, as you are about to do, dogs are still dogs, still guided by genetics which for most breeds, dictate purpose. Some were pampered pets for the ladies, or fireside companions for the gentlemen but all were loved by children who, with no television and computer games, had time for dogs. I remember my first “allowed” dog, meaning one my father chose as opposed to strays I coaxed into following me home. We went to a place out in the country, a place where daddy had taken most of the followed-me-home dogs. Mom and I waited in the car as he spoke to the elderly lady and then quickly picked out a wagging, fawning spaniel from the pack of motley mutts. A few baths and good meals later, Babe turned into a purebred Springer Spaniel. She would retrieve anything my daddy hunted. She preferred birds (of course!) 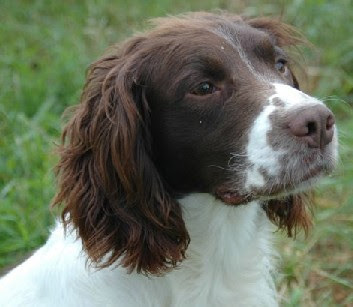 but would willingly retrieve a rabbit shot on the run or leap into the water for illegally “stunned” fish. She would not however, retrieve a gigged frog that had wiggled loose and when shown where a raccoon had washed and eaten, she delicately turned away. She learned tricks too, including how to slip away and meet me half-way home from school so we could run home together. She was immaculate; the only dog daddy ever allowed in the house. When he took out the rife and shotgun, she would wiggle with excitement, tufted tail wagging furiously as she watched him oil and clean them. With the exception of clay pigeons at the rifle range, everything we hunted was for the table. I'll never forget the first time we took her there. Not being allowed to retrieve the clay "birds" drove Babe crazy until laughing, daddy sent her out. She searched frantically, then tail tucked, she slunk back empty-mouthed. As she crouched at his feet, daddy didn't laugh. He bent over, stroked her ear and told her next time to listen when he said "get back," From then on, when we went to the gun club, Babe waited by the car. Lake Maggorie was just inside the St. Pete city limits, which to the year-round ducks, made it a safe place to hang out. My father decided otherwise on the grounds that they pooped all over the picnic areas. I don’t know how he and Babe developed the plan, I was only nine years old then, but I can tell you how they did it because he took me along. Just after daybreak, daddy would drive slowly along the far side of the lake until he had a clear shot, then drawing a bead through the car window, he would shoot a duck and quickly drive on. Babe, sitting in the back seat, marked the duck and the spot. We would drive on around the lake, Babe sitting in the front seat watching daddy; me in the back seat watching them both. When he took his foot off the gas, Babe knew. Trembling, she crouched down in the floorboards, staring eagerly at the door as he applied the brake. Daddy would reach over, open the door, and the retriever was instantly gone! We’d circle the lake again and as we approached “the spot”, my job was to search the reeds for Babe. That dog knew how to hide! That she did it on her own never occurred to me because daddy took it for granted. When I spotted her, daddy would slow to a crawl, pull over, and open the door. Sometimes the car was still moving when that flash of red and white turned into a wet retriever with a fat duck in her mouth! Babe wasn’t trained. 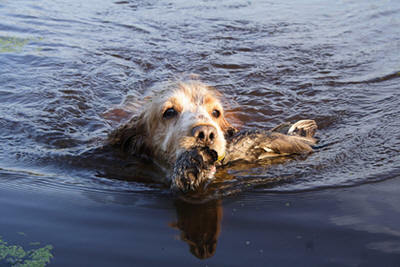 She was from sporting dogs born and bred to retrieve. That is what my father expected from her and I'm sure he never thought about the fact that she retrieved on land or water. He had no special background with dogs. He was a Comanche half-breed, a NC mountain boy who expected any animal to earn its keep. When my mother violated his spoken rule and bred her to a “champion” retriever, daddy gave the puppies away and then took Babe back to the old lady and through my tears, I saw him give her a handful of paper money. He held me accountable because mom had confided in me and I had not spoken the truth. Even as a child, I understood that to tell a lie was inconceivable in my father’s genetic code. Losing Babe taught me that not telling the truth when it mattered was just as bad. Private tears came often and for a long time after that. Babe taught me all that I’m telling you. I didn’t understand it then but genetics made her a hunter’s dream. Genetics and culture dictated my father’s hard decision. My genes and my upbringing enabled me, an only child who lost her really, truly best friend, to accept it. I couldn’t help sharing this. It must have been an overdose of sunshine and fond memories.